Signalé par Anne-Laure et @isskein sur FB. 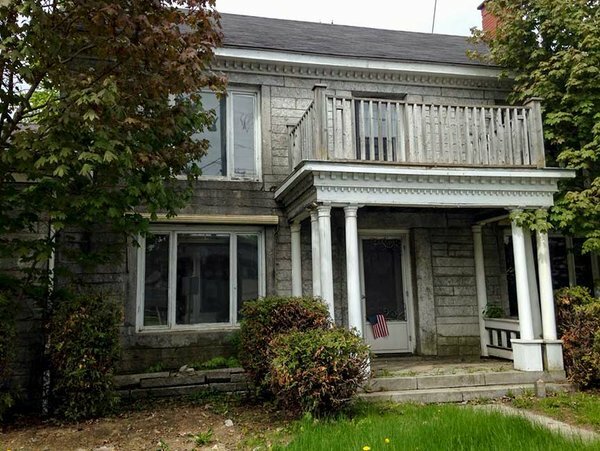 For sale, by owner, at a price barely one-tenth the cost of a closet-sized Vancouver condo or a dilapidated Toronto semi-detached: one of the most unique and historic houses in Canada, except that part of it isn’t. The building on the market is a two-storey grey stone manse with a tiny obelisk just below the front steps that marks the exact Quebec-Vermont frontier, a stop-or-we’ll-shoot sign out front, and all the woes and wonders of the modern world passing right by its windows—the tourists and travellers, the scoundrels and smugglers, the haggard, footsore human flotsam fleeing Donald J. Trump. It has been a witness to the chronicles of this bifurcated continent for more than 200 years. C’est un peu comme Berlin à l’époque du mur : des gardes frontières armés, des amerloques paranos, nostalgie, j’achète ! Excusez-moi pour la source ( Axel Springer Akademie ) je n’ai rien trouvé d’autre dans les trois minutes dispo.